On Friday 19th August I went ringing in Bahrain with Brendan Kavanagh and Nicole Proven. We got to the site quite late, deliberately, as the temperature had been very hot and Nicole and Brendan set up the nets in a reed bed area called Alba Marshes. By the time the three 18 meter nets were up it was getting quite late. We set two nets in the reed beds hoping for Clamorous Reed Warbler, Caspian Reed Warbler and Graceful Prinia amongst others and one net over an area of water hoping for waders. We started catching a small number of birds straight away and after an hour shut the nets as it was getting late and as I am a new trainee it was taking me some time to ring and get all the measurements we wanted from the birds. I was also keen to see what Clamorous Reed Warbler looked like at very close quarters so took extra time checking the wing formula amongst other things. In the end we caught eight birds before it got dark and I ringed four of them and Nicole who is a much more experienced and proficient trainee ringer than me ringed four also. I ringed two Juvenile Clamorous Reed Warbler, one juvenile Caspian Reed Warbler and an adult Kentish Plover. 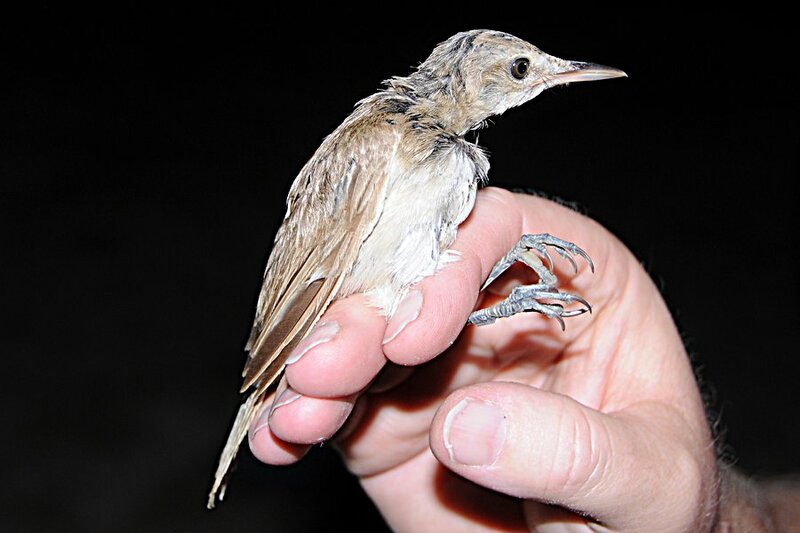 One juvenile Clamorous Reed Warbler I ringed was the smallest bird of this species that has been recorded in Bahrain and was considerably smaller than the previous bird had just ringed (see photographs below). We saw nine Black-crowned Night Heron and heard quite a few Water Rail as it got dark. The juvenile CRW is very worn. 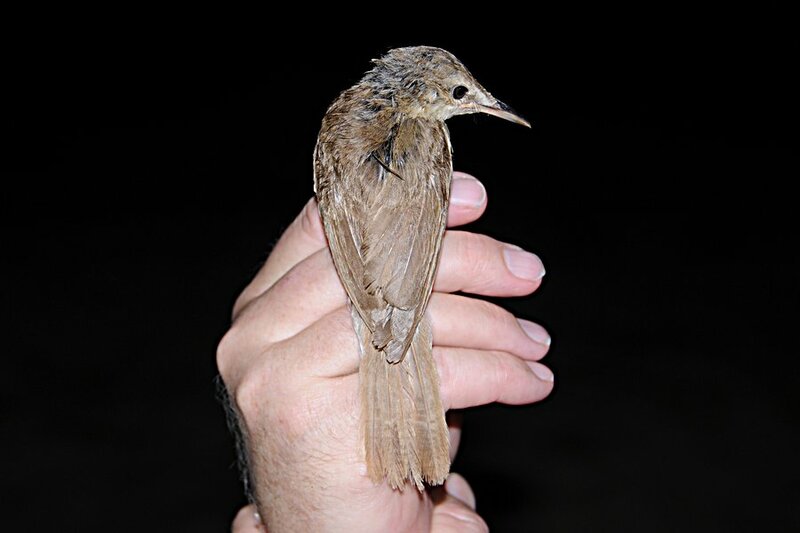 Can you explain briefly how the breeding season unfolds in Bahrein and the effect on plumages. Phil, I am new to ringing but I asked my trainer, Brendan Kavanagh to help out with your question. I thought the bird was an adult due to wear but as Brendan points out below things are not straight forward with these birds and it was decided it was a juvenile, which I guess is now back to an adult? The breeding season in Saudi Arabia and Bahrain starts in Fenruary and is still continuing into July and possibly Augus and as Brendan mentions below they brobably have three broods in a good year. Birds are resident here and some small movements a short distance from the breeding grounds occurs in the winter months but birds ahve been recorded singing in ll months of the year. Yea, Jem. This bird is an adult as the plumage is so worn. My current understanding of resident clamorous reed warbler populations is - that the juveniles have a full post-fledging moult on the breeding grounds and the adult has a post-breeding moult in the same place. 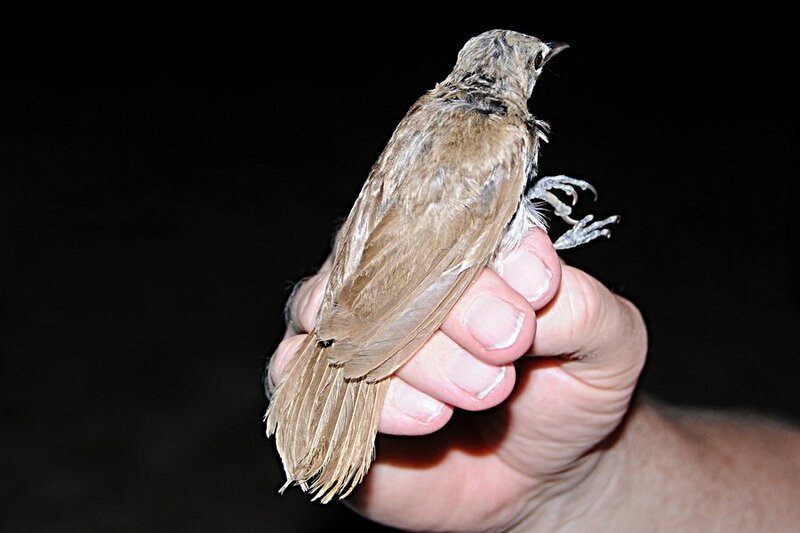 Thus a bird undergoing primary moult can be either a juvenile or an adult. The deciding factor in the hand is the degree of wear on the old primaries, a juvenile will have less wear than an adult. 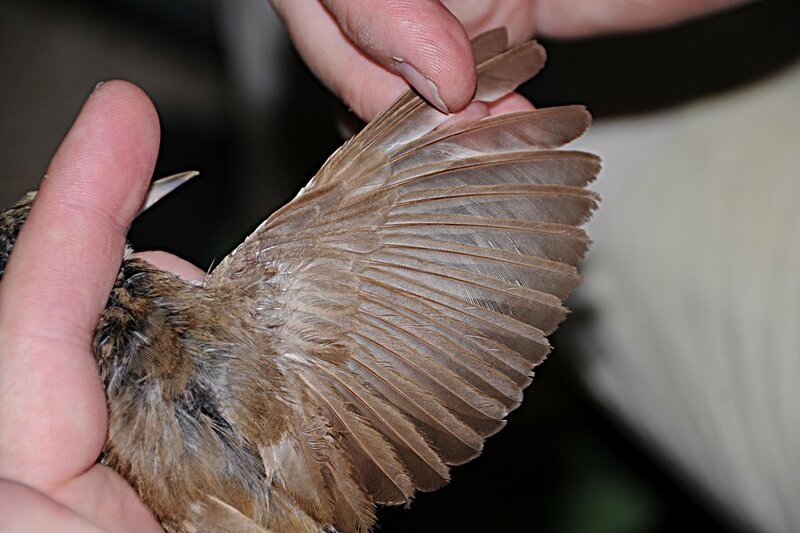 Thus the very worn bird in the photo is an adult which has not yet started its post-breeding moult. A juvenile would not be this worn. This also tells us that the clamorous reed warbler has a long breeding season here and is definitely multi-brooded. If they begin breeding as early as February, which is likely the case, then they are probably triple brooded!! 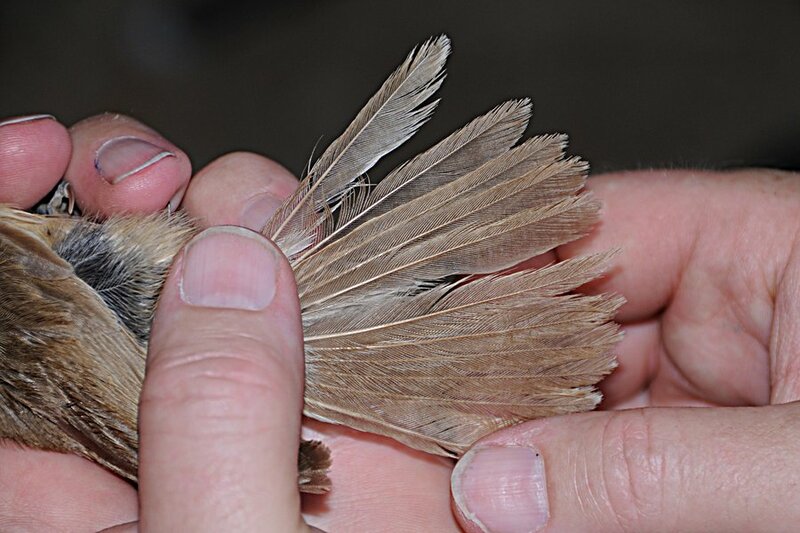 On a general note, the body moult in birds occurs during the primary, secondary and tertial moult. 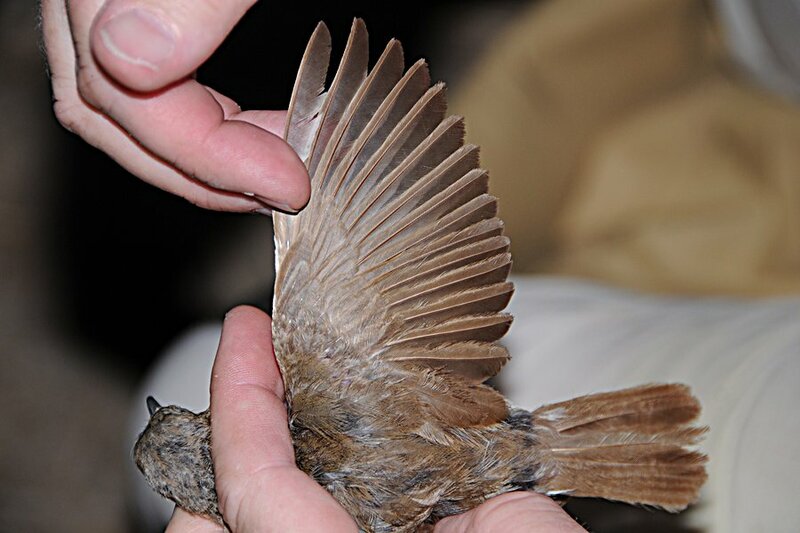 Generally speaking a bird with a body moult and no flight feather moult is considered a juvenile which is having a partial moult (replacing body feathers and some coverts but not flight feathers). At least one of our birds last week (and I think it was the bird you photographed! 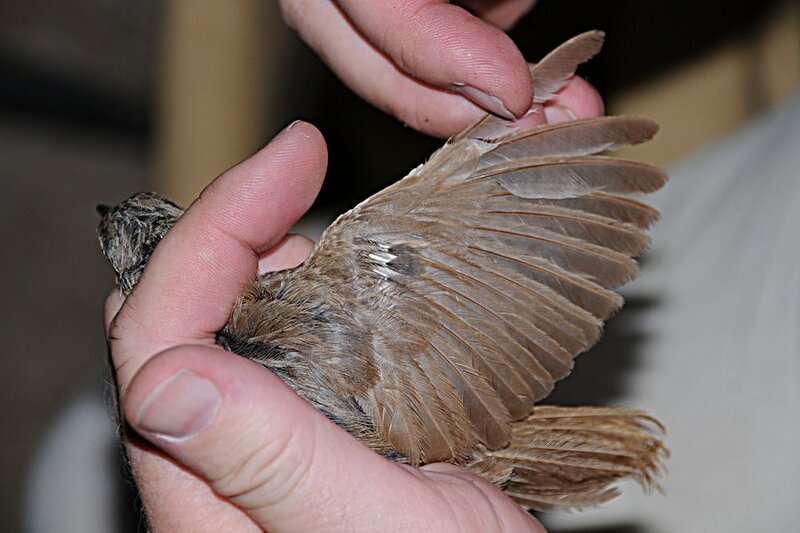 ), was undergoing a body moult only, which incorrectly led me to the conclusion that it was a juvenile bird. This is obviously not the case with this population so we need to look much more closely at moult from now on.! !